Lightweight, weather-resistant wallets made from recycled sailcloth. Recycled Sailcloth Wallets are made from the same fabrics used on the world's fastest sailboats. 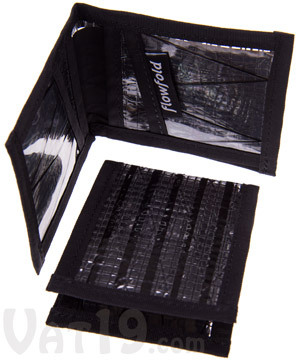 These immensely strong and lightweight materials are repurposed into wallets of unparalleled durability and convenience. Discarded or discontinued sailcloth is transformed by a small company in Maine into super-thin, super-lightweight, and weather-resistant wallets that will float even when fully loaded. 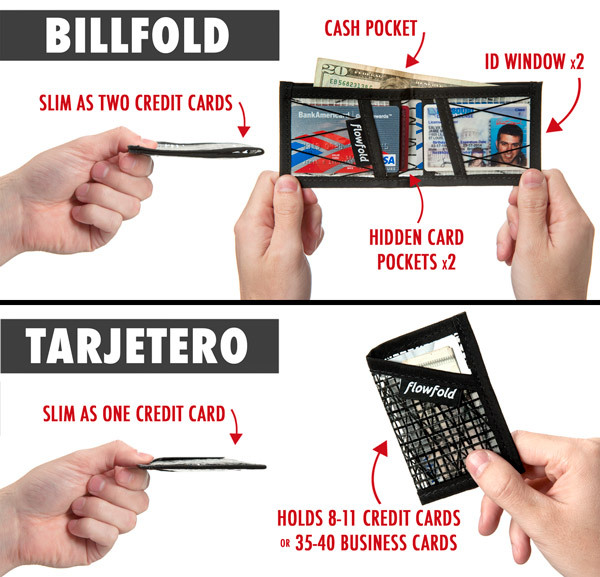 Choose from two wallet designs: Billfold and Tarjetero. The traditional billfold design features a cash pocket, two ID windows, and two hidden card pockets. The Tarjetero is exceptionally slim and designed for nights on the town, trips to the beach or gym, or simply a minimalist lifestyle. Billfold and Tarjetero wallets are available in four fabric patterns. 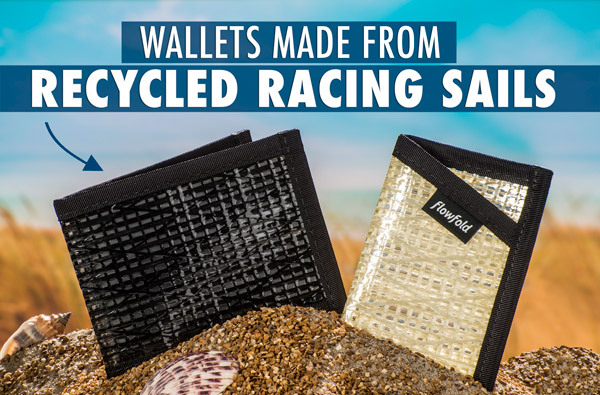 FlowFold's Recycled Sailcloth Wallets are made from the same high-tech materials that the world's racing elite use to power their vessels. Their scrap, discontinued, or slightly blemished stock is repurposed into amazingly lightweight and durable wallets. Racing sailcloths are made from Carbon Fiber, Pentex, Kevlar, or Polyester matrices which have been sandwiched between Mylar films. This translates into the strongest, lightest, and most resilient fabrics in the world. Their tensile strength (resistance to stretching) is several times greater than that of steel. Now, you can use this material to carry your cash. Sweet! 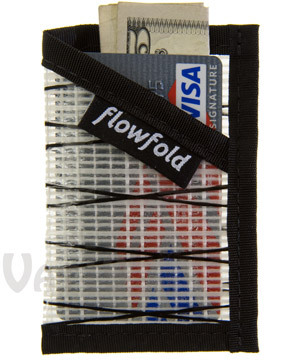 Flowfold Wallets are made from scrap, unused, or discontinued racing sailcloth. 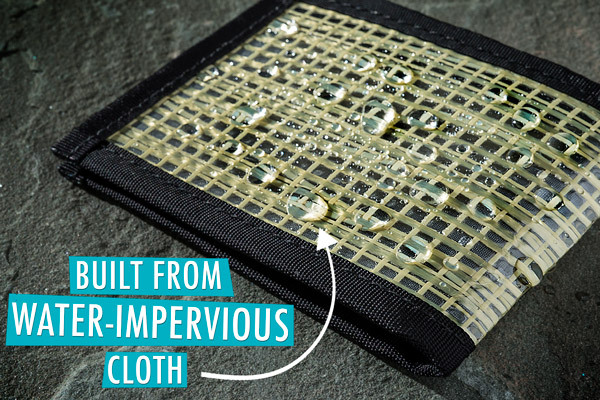 A wallet that has been made out of sailcloth is going to be perfectly comfortable with water. These suckers are completely resistant to water and will show zero signs of water damage or warping. So, if you drop your wallet in the water (or your wallet falls into the water with the rest of you), don't fear. Your wallet will be no worse for wear, your cash will dry out, and your credit cards will be fine. You now have permission to act like a complete fool around all bodies of water. Recycled Sailcloth Wallets are made from materials which do not absorb water. 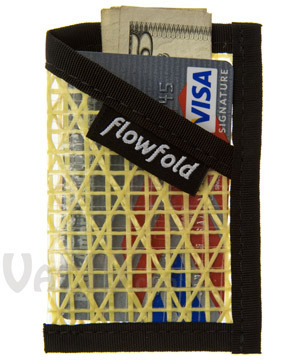 Flowfold's Recycled Sailcloth Wallets are extremely lightweight. Tipping the scales at about 16 grams, this billfold wallet weighs the same as about 3 sheets of 8.5x11 copy paper. 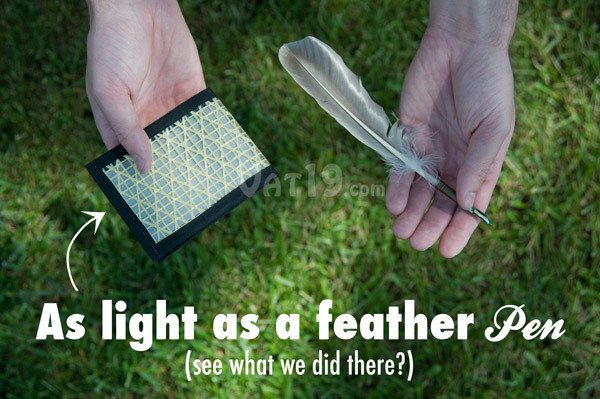 This also happens to be approximately the same weight as our Feather Pen. I'm proud to say that this is probably our most relevant cross-promo ever. Yay! The Recycled Sailcloth Billfold Wallet weighs about 0.5 ounces. 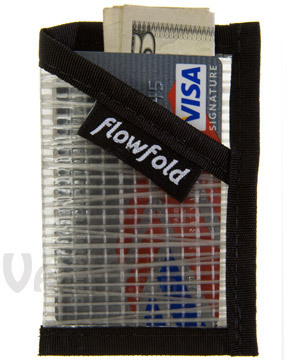 Due to the lightweight nature of sailcloth, all Flowfold Wallets will float even when stuffed to capacity. 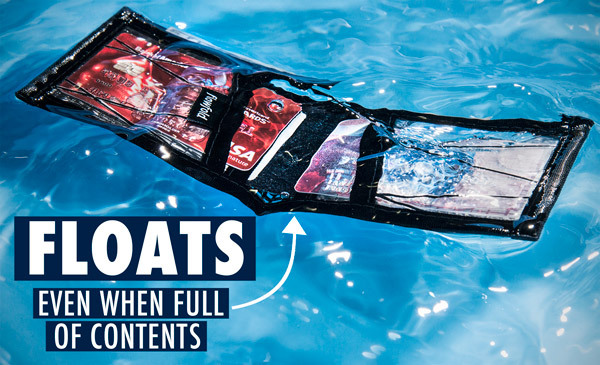 Recycled Sailcloth Wallets will float even when full. 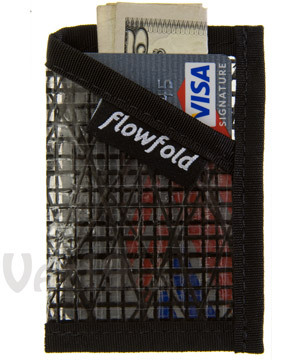 The Billfold is patterned after your standard-issue bi-fold wallet. 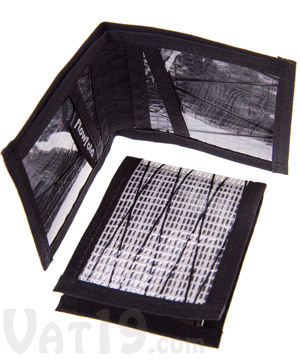 It features a cash pocket, two ID windows, and two hidden card pockets. 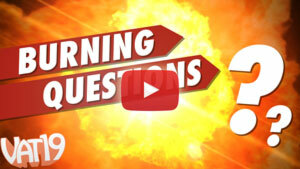 You'll be able to carry tons of cash, credit cards, gift cards (but not from Vat19.com — ours are digital! ), and reward cards (we never leave home without our Qdoba card). If you need something sleek and minimal, get yourself the Tarjetero. It fits seamlessly in your pocket as it is as thin as a single credit card. It also weighs the same as a standard sheet of copy paper. 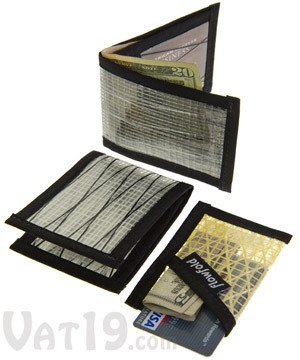 Despite its slim design, it can carry 8-11 credit cards as well as a few folded bills. 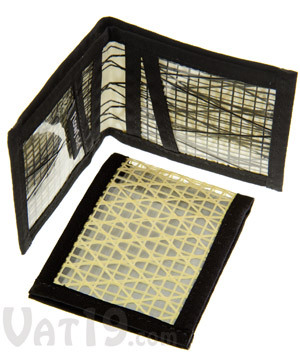 Alternatively, you could use it as a business card holder, as it accommodates up to 40 cards. Recycled Sailcloth Wallets are available in two styles: Billfold and Tarjetero. 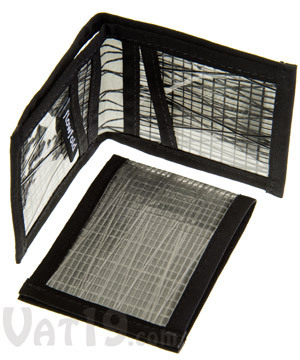 Capacity: Each ID window (two total) holds 2-4 cards. Hidden card pockets (two total) store 8-10 cards. A few folded bills plus 8-11 credit cards or 35-40 business cards. 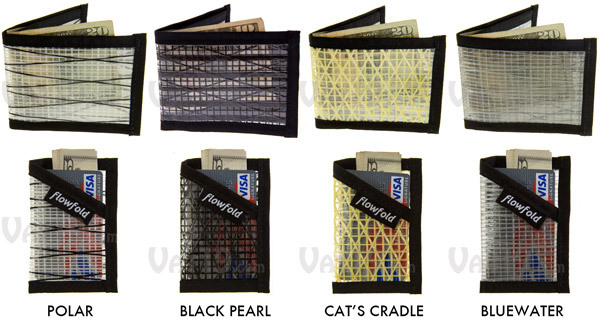 Each style of wallet is available in four styles: Polar, Black Pearl, Cat's Cradle, and Bluewater. Please note that due to the handmade nature of the wallets and the availability of scrap material, wallets may differ slightly from what is pictured below. Choose from four pattern styles. Knitted beanie with detachable, foldaway beard. Keep savagely warm with a yarn helmet and beard.